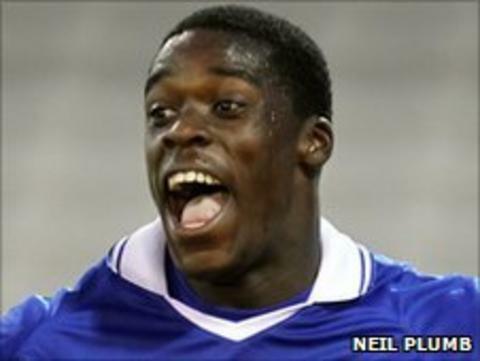 Leicester City boss Sven-Goran Eriksson believes Jeffrey Schlupp could play a role in his team's promotion bid. The 18-year-old scored his first competitive hat-trick in Tuesday's 4-1 Carling Cup victory over Rotherham. Eriksson told BBC Radio Leicester: "I saw him in training and last season in the youth team - this season he is even stronger and more confident. "He will play games for us this season. As the situation is now we don't want to let him go out on loan." The forward, who was born in Hamburg to parents of Ghanaian descent, made nine appearances for League One side Brentford on loan last season, scoring six goals. "This season he's even stronger, more confident and scored three goals which is very good," continued Eriksson. "He has a little bit of everything because he is strong. He has very good technique and a good left foot. He can fight in the air, has pace and can beat people." The former England manager was also pleased with his team's overall performance which saw them reach the second round of a competition the Foxes have won three times - including as recently as 2000. "We gave away the goal a little bit too easily," he added. "But in the second half I think we were a different class, we dominated everything, we were rather confident even at 1-0 down, we didn't panic." Schlupp is the first Leicester player to score a hat-trick on his debut since 1945 and was delighted with himself after the game. "Obviously it's a great achievement to get a hat-trick at this level," he added. "I've been playing left-back and centre-midfield on the [pre-season] tour. Now I played in my actual position, I think I've proved I can score and play at this level." He continued: "With the first game of the season coming up I'd love to be involved in that - hopefully I've done enough to be picked for the game."